About: Berkeley Women in Black began in November 1988 in solidarity with Jerusalem Women in Black which began in January of that year. Our focus is on Human Rights for Palestinians. We stand each week at the South Side of the University of California, Berkeley campus with a banner and table and distribute, to students, workers and passers-by, information about the situation on the ground in Palestine and about the various solidarity movements in progress. 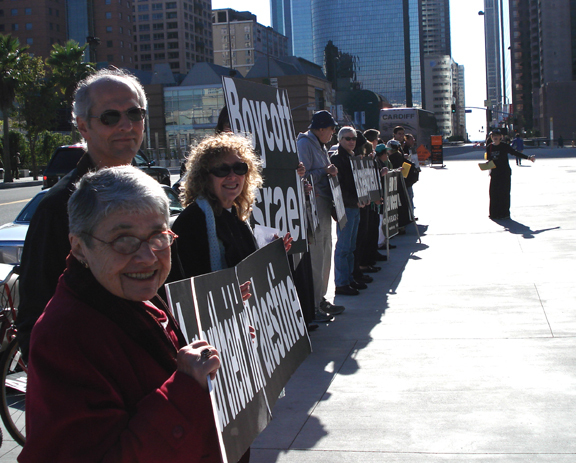 Some of us are active in the Boycott, Divest, Sanctions Movement (BDS), and in the Sabeel Conferences. Time and place: First Fridays, 5-6 pm at Montgomery & Market Sts. Time and place: Vigil day and time: First Fridays, 5-6 pm Location: Fort Bragg Town Hall, 416 N. Franklin St.
About: Vigil Name: Mendocino Coast Women in Black Vigil day and time: First Fridays, 5-6 pm Location: Fort Bragg Town Hall, 416 N. Franklin St.
About: Vigil Name: Nevada City Women in Black Vigil day and time: Thursdays, 5:15-6 pm Location: Broad Street Bridge, Nevada City. Time and place: Since April 7, 2007, Bay Area Women in Black has been standing vigil in front of the Grand Lake Theater every Saturday, from 12-1 with banners and signs, offering visible opposition to both the U.S. Occupation of Iraq and the Israeli Occupation of the West Bank, Gaza and East Jerusalem. Please come join us any Saturday. About: We are all increasingly alarmed at the dishonest explanations for the U.S. military expansion in Iraq, the growing possibility of an invasion into Iran, increasing political corruption, torture and other forms of collective punishment, the destruction of houses and agricultural lands, expulsions and illegal imprisonment. Similar concerns exist as the Israeli government and military continue to expropriate Palestinian land and water, demolish homes and create an disparate road system, engaging in practices that dishonor international law, . These actions intensify an on-going loss of Iraqi and Palestinian life, livelihood and hope. In addition to their illegality, the policies employed in Israel and Iraq fail to bring peace or security to anyone. WE NEED EACH OF YOU TO JOIN US as we use the powerful presence of our vigil to bring attention to the costs, political, economic and moral, of these two occupations that increasingly resemble each other. It is no longer simply enough to be educated about the issues or to agree with progressive writers and thinkers. With increasingly aggressive war language, monies spent, lives lost, and scarce efforts to engage honest dialogue, visible action is required. Bay Area Women in Black urges an aroused citizenry to be on the streets. Every single week. We must insist that the Congress and Senate fulfill their duty to represent their constituents. All of us, including Jews and allies, who insist that peace and justice are possible, must counter those who use name-calling and heated rhetoric. We can show that dialogue is the way forward and speaking out is necessary.